Party Poker Sofware - Poker Software Review of partypoker.com. 100% deposit bonus up to $500. $30K in guaranteed freerolls for new depositors. Extra soft cash games and tournaments. PartyPoker is a name that nearly everyone recognizes. Before they pulled out of the U.S. market, PartyPoker was THE online poker room. They were the benchmark that all other online poker rooms were measured by. Since the passage of the UIGEA and the ensuing banning of American players, PartyPoker has declined greatly in popularity. They still are a top five poker room in terms of traffic, but the players are mostly at lower stakes and are primarily active during peak European hours. As long as you aren't a high-stakes player, you should find plenty of games to play in, often with soft competition. PartyPoker has a good VIP program that offers excellent rewards for players who frequent their site. They also have an easy to clear sign up bonus with regular reload bonuses so that you always have an extra incentive to play there. partypoker has a number of large-field tournaments that are quite popular. They run on a regular schedule with different ones beginning at all times of the day. Buy-ins range from freerolls to high buy-ins of over $100 with large guaranteed prize pools. 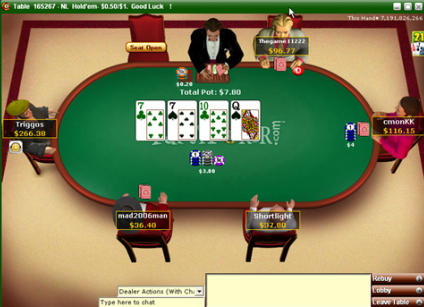 Most tournaments are Hold’em but other games are also available on a less frequent schedule. Sit-n-go tournaments run constantly at the lower and higher limits. During off hours, middle- and high-stakes SNGs can take a while to fill. In addition to poker, using your Party Account will allow you access to the Party Casino, Party Backgammon, Party Bingo, and Party Bets. While sometimes a nice distraction, in general it is a bad idea to play these games. Since PartyPoker is a major site, most poker software supports them. Any software that is broken by an update from Party is likely to be quickly patched so that you will be able to use all of your favorite helper programs to improve your play and win rate. Overall, the PartyPoker software is solid and functional without any unnecessary flair. PartyPoker also has spreads a fast moving poker game, FastForward. 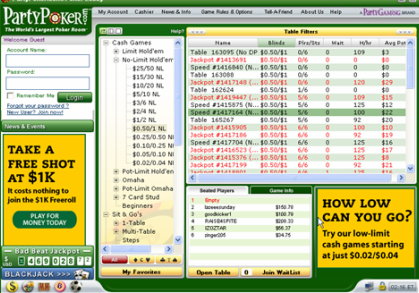 When entering these games, when you fold, you are immediately taken to another table with a new set of players where a new hand begins.